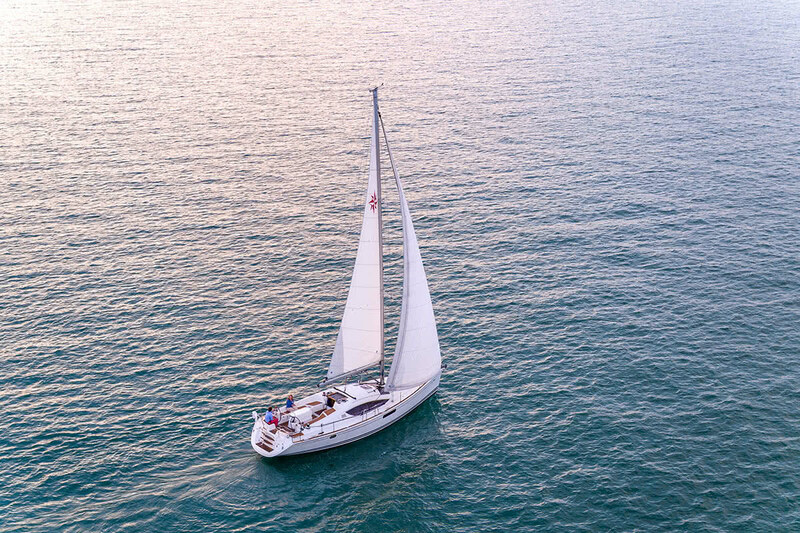 Pinnacle’s Jeanneau Deck Salon 45’s sleek interior, extended cockpit and powerful hull has been perfected by famous naval architect Philippe Briand in this yacht of exceptional stability and comfort. With twin helm stations allowing high-side operation and visibility, 45′ 4 inches of overall length, a 14-foot beam, a 5-foot bulb keel, and a 54 foot mast carrying 1080 square feet of sail area, this is a big yacht that sails brilliantly in any seas. Her state-of-the-art rigging includes an in-mast furling mainsail and 140% furling genoa, both controlled from the cockpit by three Harken electric winches, for maximum safety and convenience. 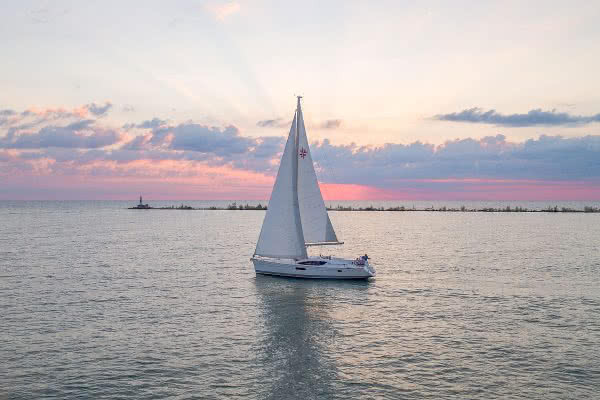 An electric bow thruster provides exceptional handling for docking and close order maneuvering. She flys under power also with a 75 HP Yanmar Turbo Diesel. 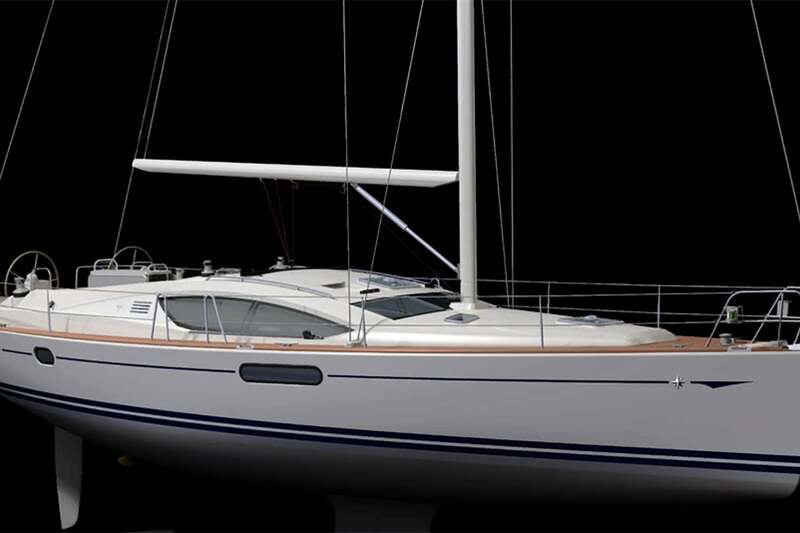 The proportions of the Jeanneau Deck Salon 45 make her very comfortable on deck. She easily accommodates twelve passengers in her spacious cockpit. Forward she has much area for sun bathing and moving about. Cockpit seats and floors are inlaid with glowing teak. 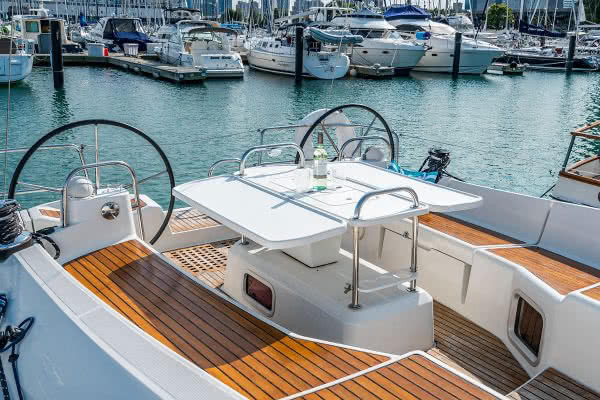 A sizable teak inlaid swim platform lets guests easily access the water. Her twin helm stations have two large leather wrapped steering wheels and areas housing top-quality Raymarine instrumentation including autopilot, boat speed, depth, log, and wind speed and direction instruments and repeaters. A Raymarine color cartographic GPS with electronic charts is also mounted in the cockpit. The Jeanneau Deck Salon 45 is also glorious below deck. Sleek, spacious and intelligently laid-out, she is warm and inviting – the perfect venue for a unique dinner with family and friends. 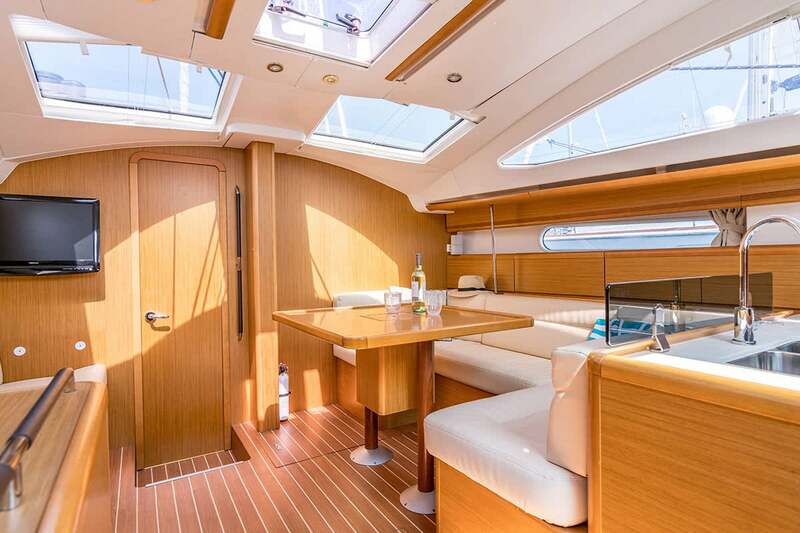 Finely finished teak is used throughout with full air-conditioning and heat control. 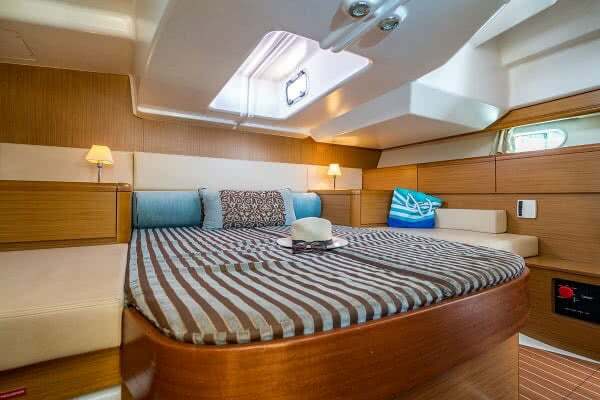 The forward v-berth cabin and full stateroom aft each have their own en suite heads and are appointed with fine cabinetry and large hatches for natural light and ventilation. The spacious aft cabin has a full double bed and with tasteful contemporary furnishings and lighting. The large main salon table, with U-shaped banquette provides seating for seven. 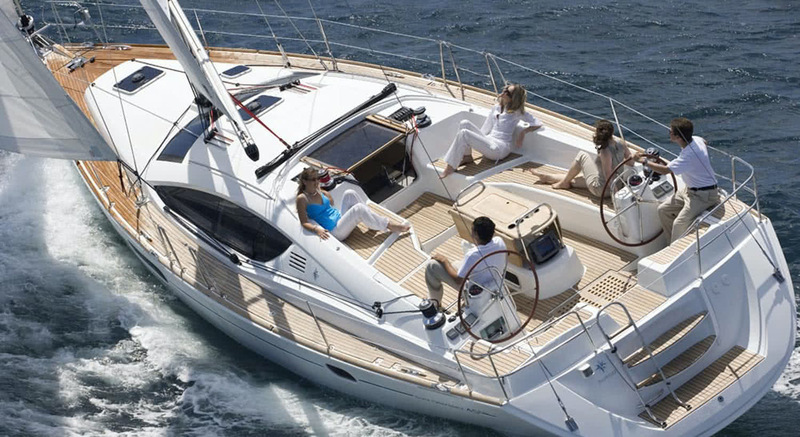 Additional seating is provided by a spacious settee on the port side. A forward-facing NAV station desk also lays to port. 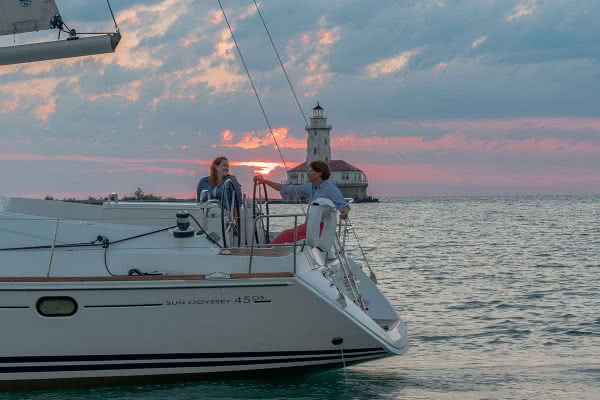 Her sizable L-shaped galley provides a four-burner stainless steel stove with oven, refrigerator and a double sink with hot and cold pressure water. The galley is stocked with quality wine glasses, plates, silverware, cookware and utensils. 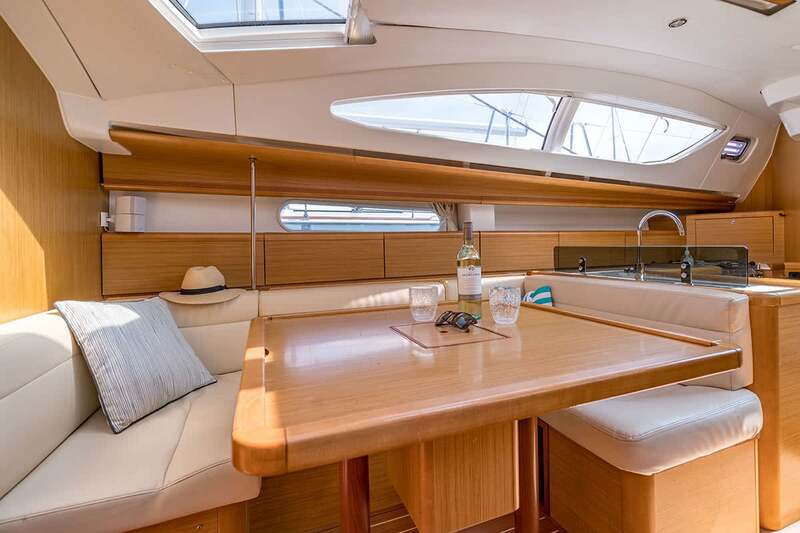 Abundant teak cabinetry surrounds the salon and galley areas. The entire space is is bathed with natural light from many opening windows and hatches.